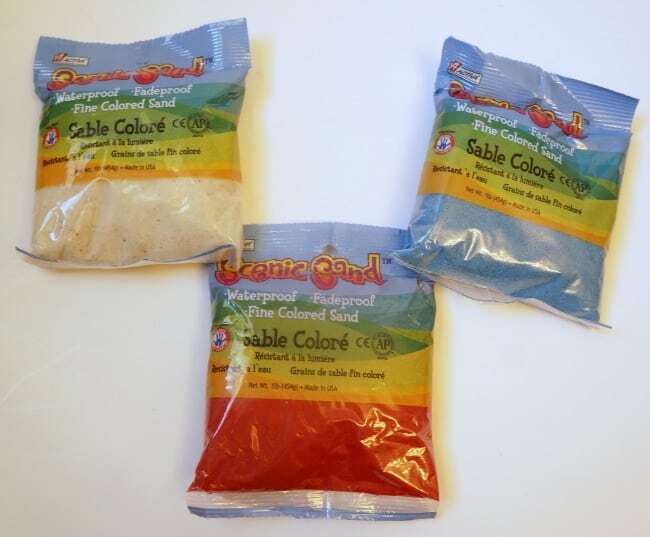 I have fond memories of layering colorful sand in plastic bottles as a young girl. I think I had a kit. I took my time alternating small amounts of bright colors and when I was done with my layered creation it came with wax that would seal the top. I hung on to my colorful bottle for a couple years before it finally toppled off a shelf and all the sand mixed together. 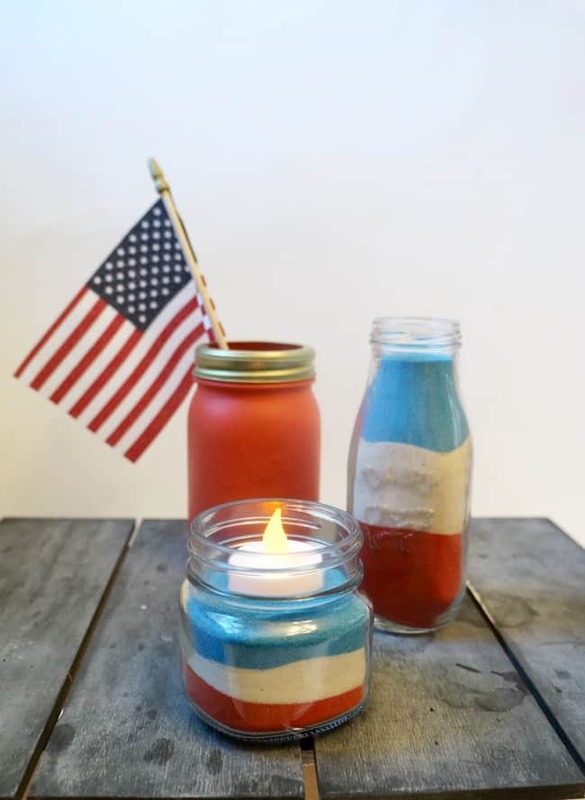 I brought back that feeling of joy this week when I created a red white and blue sand jar centerpiece. I found colorful festive sand and used a few jars I had on hand to create a pretty summer centerpiece. I used red white and blue sand, you can pick some up here. I grabbed a small glass jar and milk bottle and started layering. 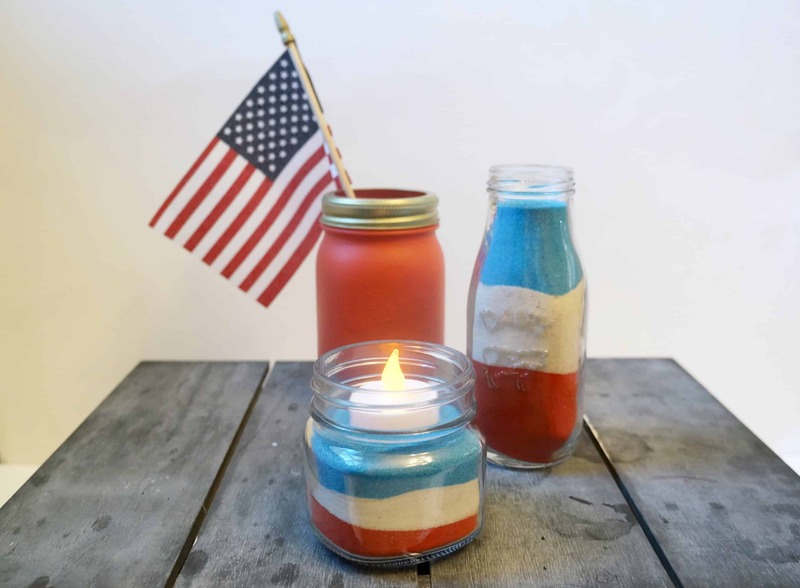 Take a look at how easy it is to make this colorful sand jar centerpiece. I used a funnel to help direct the sand exactly where I wanted it. I topped the small jar with a battery powered flameless tea light which looks so pretty outside at night. I added a red painted mason jar and flag to the centerpiece making it the perfect focal point for my fourth of July table. Have you ever layered sand or used it in another craft? I’d love to hear about it. I have sand left over and am looking for some creative ways to use it.